The Cliffs of Moher, on the edge of County Clare (and on the Wild Atlantic Way), are a must-see if you are visiting the West of Ireland. Well at least that is the received wisdom, as many say so, most guidebooks tell you, and the official website enforces this impression. True, the sheer drop of around 700 feet from a comparatively flat meadow down to the Atlantic is simply breathtaking. A visitor center and "Atlantic Edge" exhibition exist, but ultimately the natural landscape is the focus of attention here. You get stunning views of the Atlantic, and the coastal cliffs left and right of the visitor center. 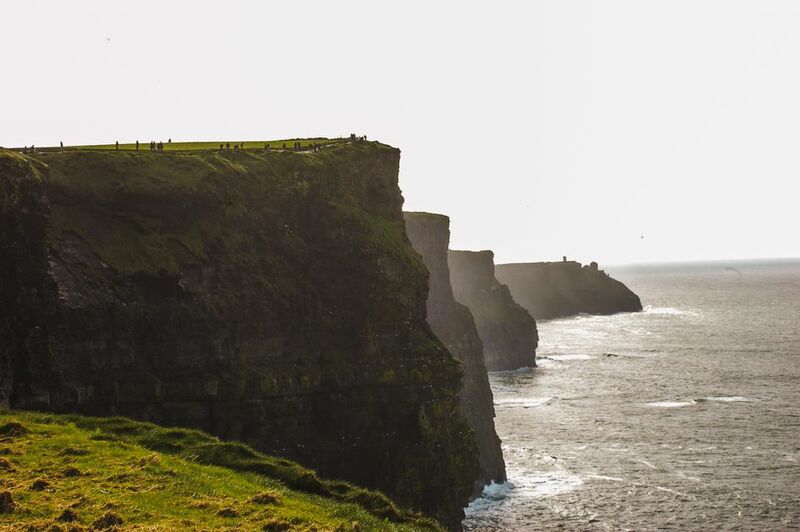 Sheer drops of around 700 feet make the Cliffs of Moher some of the highest sea cliffs in Europe. It is one of the most impressive landscapes in Ireland. There is the interesting "Atlantic Edge" multimedia exhibition. The pricing structure is not the best one. The "flat-rate entry fees" do not include O'Brien's Tower. The Cliffs of Moher can often be very crowded, especially during the main season. The Cliffs of Moher should really be a five-star-attraction - you walk along a softly winding lane and suddenly the Atlantic Ocean lies before you. Or rather beneath you, a vertical drop of around 700 feet making the difference. It is simply stunning. And a challenge to those not suffering from vertigo. How near to the drop dare you go? This perceived challenge has led to several deaths in recent years and urged Clare County Council to make the cliffs safer (and also more profitable). By restricting access, providing more security and constructing a new visitor center for safe viewing. This has led not only to rather steep facility fees (the "parking fees") but also to a brand new multimedia celebration of the natural surroundings, called the "Atlantic Edge". Well worth seeing, but it pales in comparison with the natural beauty of the cliffs. The Cliffs of Moher are back up in the top ten sights of Ireland. With no reservations except the facility fees ... they will have you gasping before you even see the Atlantic. And there is one star going - for the very blatant effort to milk the visitor as much as possible by providing a flat rate you might not want (or indeed need), then adding on extras (like a walk up a few steps to have another view ... from O'Brien's Tower). Visitors who think that the Cliffs of Moher are too crowded (as they might well be, especially on weekends in summer) might want to head further north - the much less tourist-friendly and not that easily accessible cliffs at Slieve League in County Donegal provide a genuine alternative. One reason why visitors tend to shun the Cliffs of Moher is the price to pay - which you do not really have to pay. The legal situation is complicated but works in favor of the tourist. Here is the deal: the impression created by the tourism machinery is that you have to pay to see the Cliffs of Moher or to access the area. This is simply a fabrication - the entrance fee is charged for the use of the car park and the "Atlantic Edge" exhibition. If you can live without both, you are free to go to the edge. There is a public right of way from the main road to the cliffs. The local parking regulations will, however, force you to take a long hike even if you are coming here by car (hint - the driver can drop off the passengers and then make his way own over a longer distance). There are also coastal walks between Doolin and Lahinch - free of charge too and with a great view of the Cliffs of Moher to boot. By the way - combining a visit to the Cliffs of Moher with a tour of the nearby Burren is a practical way of seeing two highlights in one day. Opening Hours: Daily from 9 AM, closing times vary according to season (closed on December 24th, 25th, and 26th). Admission Prices: Adults € 6, Children under 16 free, Students, Senior Citizens, and Disabled Visitors € 4. Reductions for groups, or when pre-booking on the internet.